The holiday season is one of the busiest times of the year for photographers. 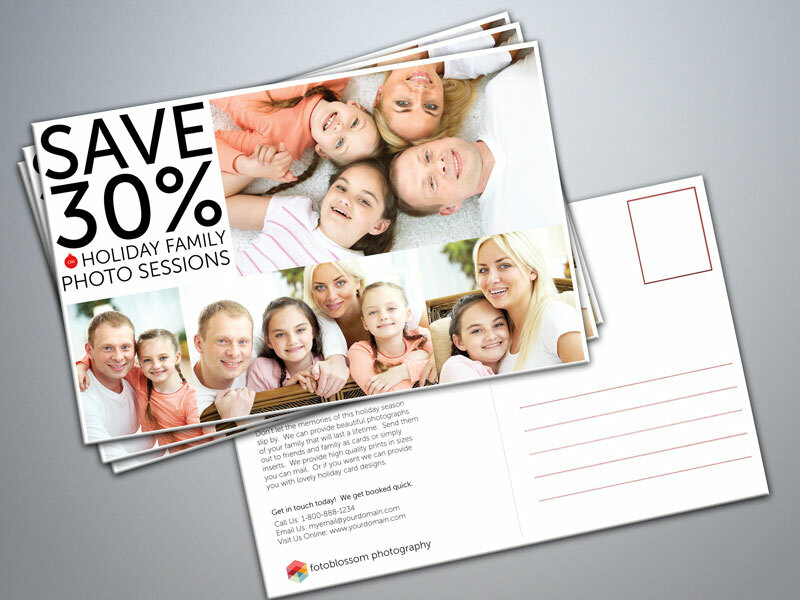 To give clients and prospects incentive to purchase a holiday photo session with you I've created these postcard templates you can send out to garner new business. 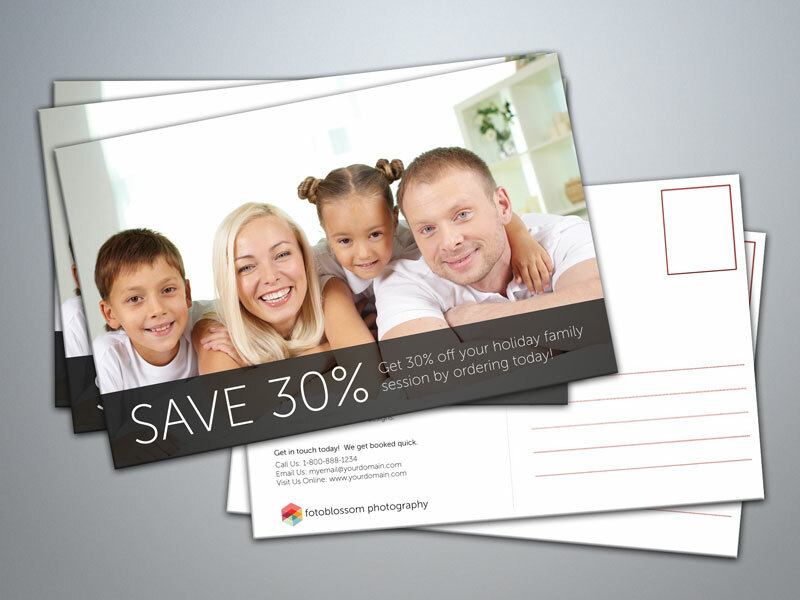 They are 300DPI high-resolution templates for printing 6×4 (landscape) postcards. The download includes 5 different designs and 1 “inside” or area where the address goes. To download these postcard templates see the bottom of this post. 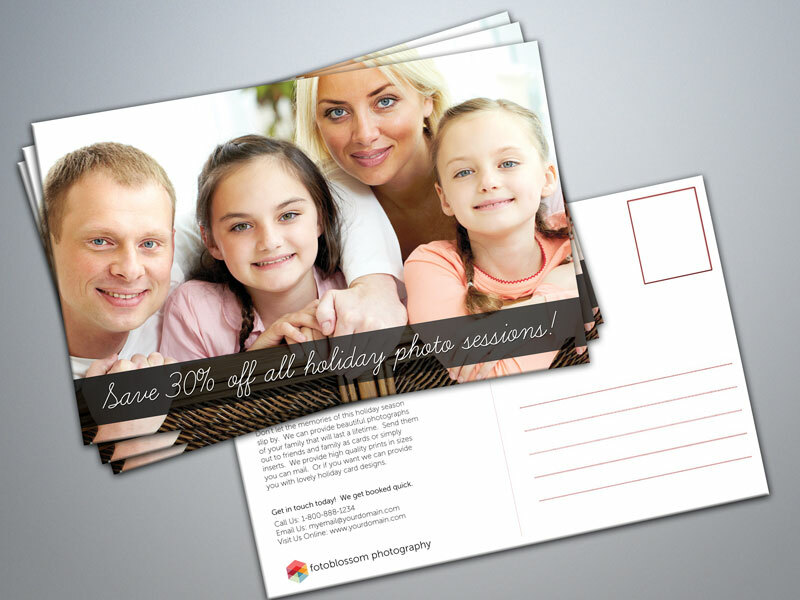 Be sure to check out my new 5×7 holiday card templates if you're a photographer as well! 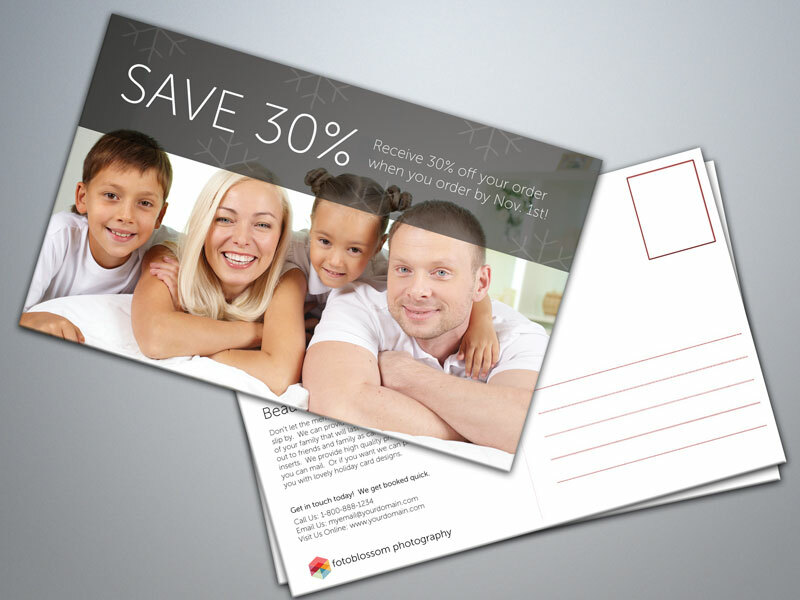 Screenshot of postcard template #1. Screenshot of postcard template #2. Screenshot of postcard template #3. Screenshot of postcard template #4. 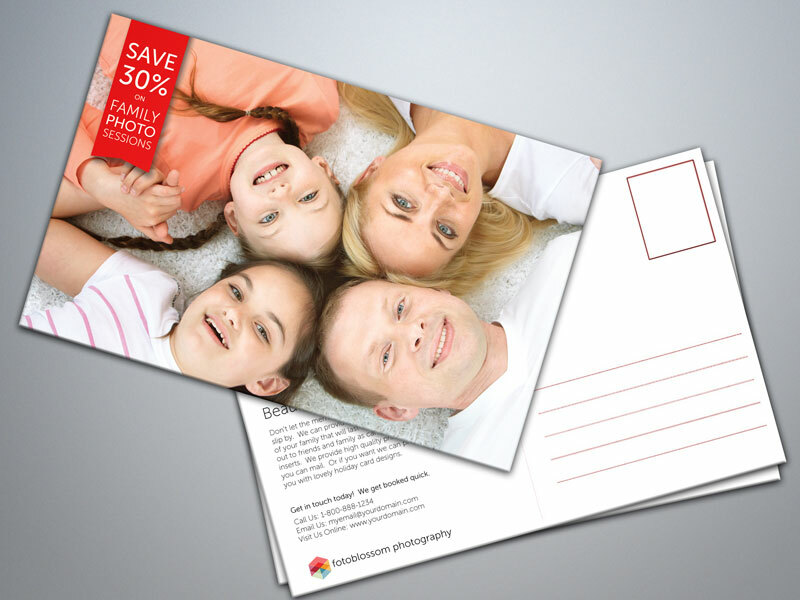 Screenshot of postcard template #5. Screenshot showing inside of postcard. 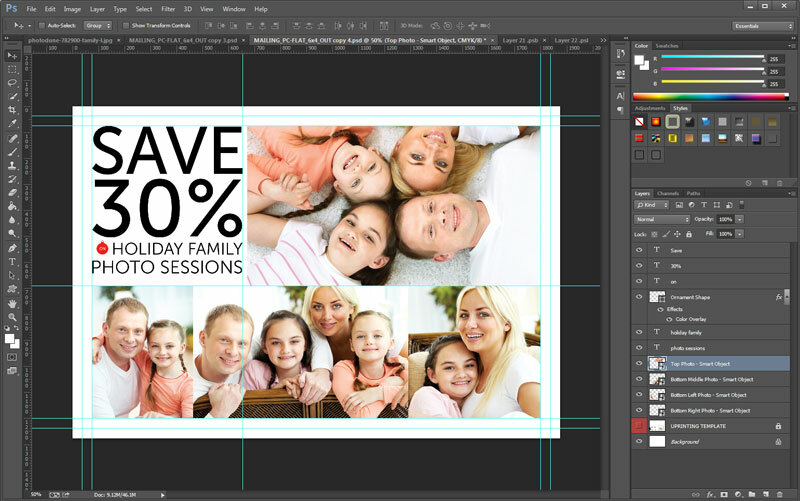 Screenshot from PhotoShop showing guides. The screenshots above are not 100% true to the 6×4 size of the templates, but I wanted to show mockups so you could see what they look like. I included a screenshot of PhotoShop so you can see the guides. All text falls within the trim lines used by printers. The original postcard template I used is from UpPrinting so they'll definitely work with their printing service. All of the templates are 6×4 landscape postcards, the standard postcard size in the US. 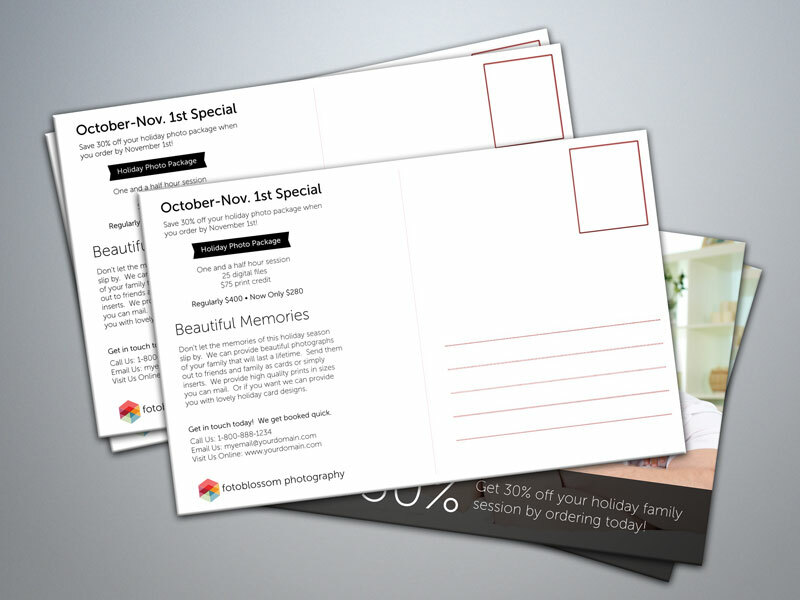 Fonts used throughout the postcard templates is mostly Museo Sans which you can download for free here. In template #4 I used Learning Curve Pro, which is also free. I did use a couple of the free PhotoShop shapes I've made available. You won't need them for the templates, but if you wanted to change some of the shapes you can use some of the alternatives in the free shapes palette. Like any templates you'll want to go in and edit them with your own photos and text. All text and images are editable. For instance you might want to change them so they say 20% off instead of 30% off, etc. The front designs are pretty simple, but the inside template has a bit more text you'll want to change. The inside includes a space for your logo as well which uses a SmartObject, like the images. You'll want to double-click each SmartObject, which will open up the object and then you paste in your image and close the file, which will update the template. And of course you should use your own photos in the templates, preferably some that you took last holiday/Christmas season. I designed these templates in Photoshop CC (creative cloud). They should work in older versions of PhotoShop by a few versions like CS4, CS5 etc, but I have not tested them in any older versions. If you don't have PhotoShop you can purchase just the license to PS for as low as $9.99/mo, but I really don't know if that deal is still on. Check Adobe's site for updated pricing. Once you've made your changes you'll want to flatten all the layers and export the image as a tiff, jpg or whatever your print service requires at 300DPI so it prints nice. Like I mentioned I used the postcard template guide from UpPrinting, but if you choose to print these out somewhere else the templates will still work. Basically I used them to follow the trim lines so none of your text will be cut off in the trimming process. If the templates are not what you desire in terms of their design they can be used as starting points. They should save you some time. They could also be used to promote yourself on your Facebook page by exporting them as lower resolution jpegs say 800 pixels wide. To download simply subscribe to my newsletter to receive the download links. Templates are provided in a zipped file once downloaded. Let me know if you like them and if you have your own website feel free to link to this post. If you think other photographers would enjoy these please share this with them. I'd appreciate it! Hope you have a good holiday season and be sure to follow subscribe to my newsletter for more free downloads and LIKE ME on Facebook. I'm going to be releasing some more free stuff photographers can use soon. wow!!! files and links like this are a big help to us designers!!! Thank you! How do I download the postcard templates? I signed up for your newsletter and I still cannot download. Jamie, I don’t show you signed up. Sign up again with your main email address and try it again. Hi!! !I ‘m not able to download the file. I registered and confirmed my email , but I have not received anything yet….can you help me, please? Hi Marta, looks like you finally got the email. Thanks for subscribing. Ana, seriously have a second of patience. This stuff isn’t instant. Every time someone says they haven’t received the email and then I check and it shows you’re subscribed… it’s time out of my life. Please wait a few minutes and if you think you haven’t received anything, check your spam folder. Thank you for understanding. Hi, sign up to the newsletter and didn’t receive the email to download the files. Let me know if any step is missing. Thanks! I show you are subscribed. When subscribing, please be patient… the download email is not sent out instantaneously. It does take a few minutes.